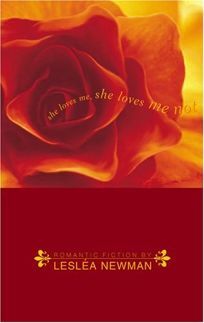 From romantic mores and butch-femme dynamics to extraordinary coincidences worthy of Sophocles, Leslea Newman sketches still more aspects of lesbian life in the 11 short stories of She Loves Me, She Loves Me Not, her follow-up to Girls Will Be Girls. A teenage girl is just becoming aware of her own attraction to other girls when she catches her father in a pink nightgown, dabbing his lashes with mascara and singing along to ""I Feel Pretty."" A woman tries to muddle through the days after just having lost her partner in a freak accident (her lover was pushing a woman with a baby out of the way of an oncoming car). Though the plot turns won't surprise, Newman's warmth and wry wit should once again charm fans.